Vinyl’s base ingredient is rigid PVC (polyvinyl chloride) modified to provide superior strength and ultraviolet resistance. Our vinyl is impact modified for flexibility and durability. All RDI post sleeves meet or exceed the requirements for long-lasting durability and performance after installation. 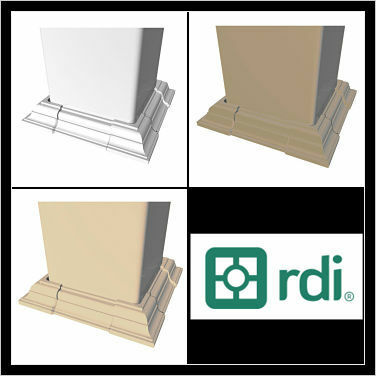 The RDI post sleeve is ideal for covering unsightly posts. Offered in 3 colors this sleeve will match any rail system in todays market. This sleeve offers a beefy 1/8" wall thickness.If you have recently purchased a home ~ or have even lived in the same home for a number of years ~ there may be some quick improvements that will help update a space and make a house feel more like your own. One quick home improvement that will do a world of good is upgrading old posts that support deck or porch railing systems. If you think that kind of work is bound to be costly, think again. Using vinyl post sleeves from RDI, you can give your porch or deck a much-needed refresher with very minimal cost. Simply apply the 6" x 6" post sleeves to any unsightly, weathered, or worn down posts, and you’ll notice an instant sense of accomplishment in making your home look welcoming and refreshed.Made from sturdy vinyl, this sleeve can withstand all kinds of weather, including humidity, rain, snow, and extreme heat. RDI is so confident in the quality of its vinyl post sleeves that the company offers a lifetime warranty to guarantee your purchase. Still have questions or need advice on ordering the right supplies for your project? Get in touch with Deck Expressions’ 24/7 customer service. We’re always ready to help. All mounting brackets are included with the rail sections. Use the adjustable post skirt to dress the bottom of the post. Skirt can also be used at top of post at ceiling! Product is good but shipped in a bag as opposed to a box sometimes makes susceptible to damage in shipping. love the quality of this product! I have look for the right price to match a great product and deck expressions really exceeded my expectations! This is my second order already! very pleased with the quality and the price of the post covers. i ordered two to see if they were what i was wanting before ordering the rest (15). i will be ordering the rest, and other items i need for the current project. Product arrived quickly. Installation went well. Looks great! Great fitting product, I was told at my local home improvement store they no longer made sleeves and that I would need to get a wrap. Found this online and could not be happier. Color matches perfectly with my décor and the fit was perfect, just cut to length and put on the cap. Good shipping as well, product was well protected. These post sleeves fit perfectly around 6x6 treated lumber, with just a little bit of play so no trimming of the wood corners needed - if you've used many post sleeves, you know what I'm talking about! Ordered 11 of these for a new house, 8 on the front porch and 3 on the back patio. They shipped quickly and arrived undamaged, and the price was the lowest I could find anywhere online, thanks to the free shipping based on the order size. Highly recommend not only this product, but also Deck Expressions. I will be using them for future projects for sure! I ordered this sleeve to replace an old wooden post that held an entrance sign. This new one looks great! And will never need paint - even better! I bought the Elite Post Cap to complete the look. I called the company and spoke to a gentleman who was very helpful in getting me all the right pieces. The delivery was made a day earlier that expected. I would use this company again.